Louis I (Ludovico I or Lodovico I in Italian; 24 February 1413 – 29 January 1465) was Duke of Savoy from 1440 until his death in 1465. He was born at Geneva the son of Amadeus VIII, Duke of Savoy and Mary of Burgundy; he was the first to hold the title of Prince of Piedmont. On 1 November 1433 (or 12 February 1434), at Chambéry, he married Princess Anne of Cyprus, an heiress of the Kingdom of Cyprus and the defunct Kingdom of Jerusalem. The family lived in Allaman Castle, Vaud/Switzerland and as Count de Vaud, Savoy tried to conquer the Duchy of Milan, then under the Repubblica Ambrosiana, but failed. In 1452 he received the Shroud of Turin from Margaret de Charny. It was held by the House of Savoy until 1946, at the end of the Kingdom of Italy and bequeathed to the Holy See in 1983. Louis died at Lyon in 1465, while returning from France. 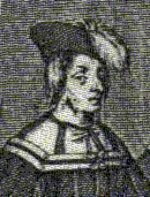 Amadeus IX (Thonon, 1 February 1435 - 30 March 1472), Duke of Savoy. Louis (Thonon, 5 June 1436 - Ripaille, 12 July 1482), Count of Geneva, King of Cyprus. Marie (Morges, March 1437 - Thonon, 1 December 1437). Philip II (Thonon, 5 February 1438 - Torino, 7 November 1497), Duke of Savoy. Marguerite (Pinerolo, April 1439 - Brugge, 9 March 1485), married firstly in December 1458 Giovanni IV Paleologo, Marquis of Montferrat and secondly Pierre II de Luxembourg, Count of St. Pol, of Brienne, de Ligny, Marle, and Soissons. Pierre (Genève, ca. 2 February 1440 - Torino, 21 October 1458), Archbishop of Tarentasia. Janus (Genève, 8 November 1440 - Annecy, 22 December 1491), Count of Faucigny and Geneva, married Helene of Luxembourg, daughter of Louis de Luxembourg, Count of Saint-Pol, and his first wife Jeanne de Bar, Countess of Marle and Soissons. Charlotte (Chambéry, 16 November 1441 - Amboise, 1 December 1483), married King Louis XI of France. Aimon (Genève, 2 November 1442 – Genève, 30 March 1443). Jacques (Genève, 29 November 1444 - Genève 1 June 1445). Agnes (Chambéry, October 1445 - Paris, 16 March 1509), married François d'Orléans, Duke of Longueville. Their son is Louis I d'Orléans, duc de Longueville. 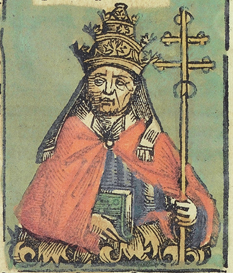 Jean Louis (Genève, 26 February 1447 - Torino, 4 July 1482), Bishop of Genève. Maria (Pinerolo, 20 March 1448 - 13 September 1475), married Louis of Luxembourg, Count of St. Pol, of Brienne, de Ligny, and Conversano, Constable of France. Bona (Avigliana, 12 August 1449 – Fossano, 17 November 1503), married Galeazzo Maria Sforza, Duke of Milan. Giacomo (Genève, 12 November 1450 - Ham in Picardy, 30 January 1486), Count of Romont, Lord of Vaud. Anne (Genève, September 1452 - Genève, 1 October 1452). François (Annecy, 19 August 1454, - Torino 6 October 1490), Archbishop of Auch and Bishop of Geneva. Jeanne (Died without alliance, 1455?). Wikimedia Commons has media related to Ludovico di Savoia. ^ a b Ward, Prothero & Leathes 1911, p. 69. ^ Grendler 2017, p. 260. ^ Fletcher 2000, p. 75. Fletcher, Stella (2000). The Longman Companion to Renaissance Europe, 1390-1530. Pearson Education Limited. Grendler, Paul F. (2017). The Jesuits and Italian Universities, 1548-1773. The Catholic University of America Press. Ward, A.W. ; Prothero, G.W. ; Leathes, Stanley, eds. (1911). The Cambridge Modern History. The Macmillan Company. Francis de Bourbon or François de Bourbon, was a French prince. He was the Count of Vendôme. 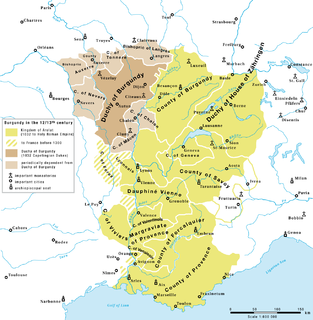 The County of Geneva, largely corresponding to the later Genevois province, originated in the tenth century, in the Burgundian Kingdom of Arles (Arelat) which fell to the Holy Roman Empire in 1032. Louis de Luxembourg, Count of Saint-Pol, of Brienne, de Ligny, and Conversano belonged to the Ligny branch of the House of Luxemburg and was Constable of France. Amadeus VIII was a Savoyard nobleman, the son of Amadeus VII, Count of Savoy and Bonne of Berry. He was surnamed the Peaceful. After the death of his father in 1391, his mother acted as a regent, because of his youth. He was an antipope of the Catholic Church from 1439 to 1449 as Felix V, in opposition to Popes Eugene IV and Nicholas V.
Anthony I, Count of Ligny (1450–1519) was the youngest son of Louis de Luxembourg, Count of Saint-Pol and his wife, Jeanne de Bar, Countess of Marle and Soissons. In 1482, he inherited the County of Brienne from his brother Peter II, Count of Saint-Pol. After the death of Charles of Bourbon in 1510, Anthony inherited the County of Ligny, which thereby fell back to the House of Luxemburg.